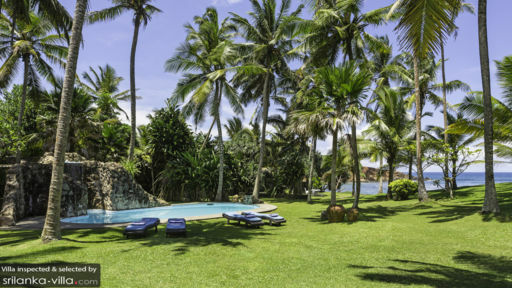 Villa Weligama is a four-bedroom beachfront property found in idyllic Weligama, a sandy village along with southern coast of Sri Lanka. A serene bay area where guests can explore the nearby beach or even spot stilt fisherman in action. There is a beautiful coral reef waiting to be discovered. The villa itself celebrates island living with a lot of open spaces, inner courtyards, patio, and open-air living areas to make the most out of these luxurious natural surroundings. Flanked by a natural stone waterfall is an oval-shaped swimming pool set amidst verdant tropical gardens! Featuring a soothing colour palate with natural wood, the four bedrooms at Villa Weligama are the definition of understated beauty. With antique wooden furniture, two bedrooms feature double beds while the other have triple beds. Four-poster king-sized beds canopied with sheer, white drapes and the bedrooms are perfect spaces to retire to after a day of exploring! The rooms are air-conditioned so they can be kept cool during hotter hours of the day. For four bedrooms, there are three well-equipped bathrooms with hot showers and other necessary amenities. 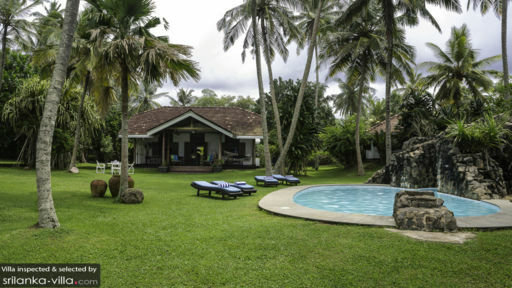 There is so much to see at Villa Weligama as it is one with the beach that extends out to meet the luscious tropical gardens of the villa. The villa’s own swimming pool is filled with freshwater for a refreshing swim. A calming natural stone water feature feeds the pool and you can relax on the sunbeds while relishing the view. The beautiful ocean beckons and you can rinse off under the outdoor shower to play around in the water. Enjoy a spectacular sunset while lounging on the seaside benches that sit facing the horizon. The villa patio is furnished with chairs where guests can sip on their morning tea as the world awakens! The architecture of the villa is traditional Sri Lankan with hints of its colonial past reflected in the grandiose structure. The living area is an open-plan concept housed under a shingled roof with perforated or no walls. With the sunlight streaming in as well as the fresh air making its rounds, this is a nice and pleasant space to be in while you relax on the comfortable corner sofas or armchairs. As if this wasn’t enough to convince you, there is an actual hammock along the living room just overlooking the pool for the perfect lie-in! Enjoy a meal wherever you may like: along the beach, villa gardens or on the patio, you can even relish delicious Sri Lankan offerings indoors if you feel like! A personal chef can be appointed by the villa especially for you, as they will be happy to delight you with the most delicious food you ever had! There is a dedicated team to look after the needs of the guests including cooking, housekeeping, and transportation. There are some services such as meals and traditional Ayurvedic massages that are additionally charged. If you wish, the staff can even arrange for excursions and tours in Weligama! The villa is ideally situated close to the beach and there are a host of water activities such as snorkelling and surfing that you can engage in. Explore the coral reef or interact with local fisherman as they go about their usual days! The beauty of Weligama is best experience while walking along the shore and simply basking in it calm surroundings. Our family of 4 enjoyed one of our best ever holidays staying at Lanka Lodge. The quiet, secluded location overlooking the Indian Ocean, set in a wonderful, large garden is very impressive. The spacious airy bedrooms are set around an internal courtyard. 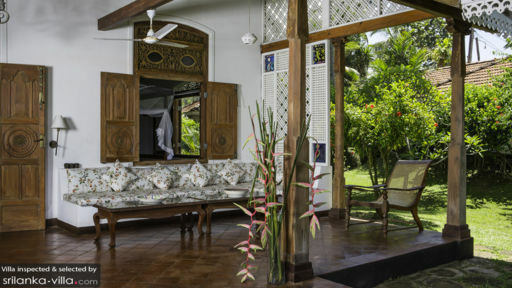 There is a huge verandah with dining table and arm chairs with a great view of the local wildlife, fireflies, kingfishers, chameleon, monitor lizards through the palm trees, past the pool to the sea. But perhaps the best thing about Lanka Lodge is the staff. Kumal produces really delicious meals, Kumare looks after you, Malka's smile makes the mornings even sunnier and Lianage will drive and guide you safely and calmly on trips out, if you can bring yourselves to leave. Andrea, the owner responded very rapidly to my emails, when we booked and has made the booking process easy and well organised. There is lots to do in the area, a variety of beaches for surfing and snorkelling, whale watching in Mirissa, the Dutch fort in Galle, are close by and Yala and other national parks are in reach for a day out. We were a party of 8 with ages ranging from 30's to 70's. We all thoroughly enjoyed our stay in this beautiful peaceful spot. The staff were lovely - always cheerful and ready to help. Kumala ran the house very efficiently and unobtrusively always making it feel it was 'our place'. Lucky cooked really delicious meals - some of the best we had in Sri Lanka. In fact, for my birthday celebration we decided not to eat out and had a special meal which was enhanced by the fact that Kumala had made the garden really pretty with lots of flaming lamps. We would love to return one day. I usually don't write reviews and I have never given 5 stars on a review that I have written as of yet but this time I am compelled to do so! This place was so amazing! Total relaxation and a very personal, loyal staff to take care of all your needs. The location is perfect as it is close to several attractions that you can get to during a day's drive. It was even hard to leave the property itself as it was very clean, great views, and the staff was just awesome. The cooking by the staff was really one of the best culinary experiences I have ever had and I have been to over 80 countries....again, the food was unbelieveably good! The driver was very knowledgable and he knew exactly the right places to go whether it was a day's excursion to a national park, a historic town, or just the beach. He knew all the right places to go and we were driven in a very nice air conditioned van where you can really relax and enjoy! The service was airport pick-up to airport drop-off....perfect. My family, friends, and I are very satisfied with our stay and we will be recommending this place to everyone we know. You will not regret staying here and it will be difficult to leave, especially the warm and curtious staff. I usually never return to the same place twice but we will for sure be coming back here on our next trip to Sri Lanka. Many thanks to the owner and staff!! !